Backpacker’s beware – you will spend more time in Salento than you planned. Leaving Medellin, we took a bus to Manizales – one of the three cities in the coffee region of Colombia (Periera and Armenia being the other two). We drove through the mountains and eventually spiraled down into a valley with another large city. We were pretty tired of city life so we spent one night there and did some research on where to head next. The word on everyone’s mouth was Salento so we took the chance and headed there the next day. Our research pointed us to The Plantation House. We took the bus into the small town of Salento, nestled in the mountains. The hostel, also a working coffee plantation, offered just what we were looking for – relaxing with a beautiful backdrop. We spent Saturday night on the town square drinking beer and Aguadiente with the locals. Sunday – we did nothing except admire the little town and its lookout places. Salento is such a quaint little mountain town with stunning views. Monday we decided to take the coffee plantation tour and were so glad to learn the farming side of coffee. 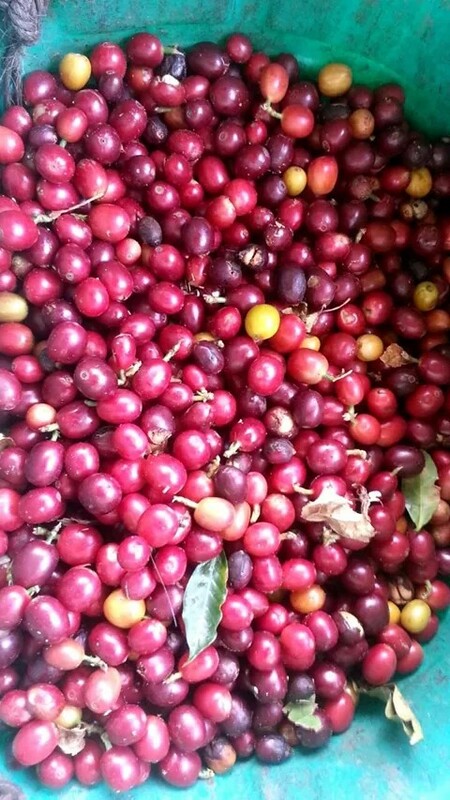 The guide took us through all the steps from coffee cherries to green beans. They even roasted dry beans in front of us, ground the roasted beans, and made us the freshest coffee you can ever have. Red beans are squished through the machine revealing the green bean inside. Green beans are then washed and dried. 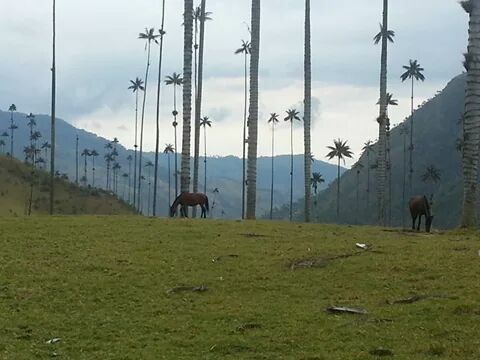 Tuesday, we were intending to tour the Valle de Cocora but we were stopped. The Plantation House asked us to switch rooms, which is mildly inconvenient but fine. But the other room cost more money. We were a little frustrated so we looked for an alternative hostel. During our search, we landed upon Hostel La Casona which offered cheaper dorm room and even cheaper tents with matresses (10,000 per person, about $5). Bingo. We made the switch just as a group from the hostel was about to leave to hike to a nearby waterfall. We jumped on board and made our way. The hike was about 5 hours total with about an hour enjoying a picnic by the waterfall and a very brief extra freezing swim in the fall. Wednesday, Esteban, our guide from the previous day, was taking a group to hike the Valle de Cocora. We happily joined and were stunned by the amazing views while we walked down the mountain. The Valle has hundred year old huge wax palms growing on the mountain. It seriously looks like Jurrasic Park could have been filmed there. Thursday, we spent the day relaxing after the hike. We decided to stay one more night (as the saying goes). While we were enjoying a beer, Scott, and Australian bloke, showed up asking about visiting Los Nevados National Park nearby. Some of the mountain range hits 5000 meters and a few have Colombias only snow. We were interested in the sound of the hike so we decided to wait another day to get a little more information. That evening, we watched the guys from a few hostels play futbol. At least the following countries were represented in the game: Colombia, Australia, USA, France, Germany, Israel, and The Netherlands. There were probably more. Travelling is cool. After watching the guys play, we decided to go try out a local game called Tejo. Tejos are heavy palm sized stones. Everyone is assigned their own tejo and teams are formed. Each player throws the tejo at a board covered in a clay mud mixture where it sticks. There is a metal ring in the center with four paper triangles on points of the circles. These paper triangles are filled with gun powder which explodes between the stone and the metal . The goal is to get the tejo inside the ring for the most points, but it’s far more entertaining to hit the paper triangles for less points. What a game. Friday, the guide showed up and we discussed the details of the hike. The price for his was about 180,000 per person for 2 nights, 3 days. We were all interested, but Esteban decided to call his friend Freddy who has guided groups through Los Nevados before to ask a few questions. Freddy arrived an hour later and said he would guide us up for about a third of the price. Sweet. That day, we readied our backpacks and bought provisions for the trip. We would be heading out at 5 am to begin the incredible ascent. With a little bit of nerves and a lot of excitement, the group ate breakfast and headed out, five of us including Freddy, our guide. Our hike began in the Valle de Cocora at about 6 am. The five of us began the ascent very early with about 18 lbs each in our bags. Up we went. And up. Up. More up. As much as I love nature and have done my share of nature walks, this was my first true overnight backpacking hiking experience. And my lack of experience for this daunting hike was pretty obvious right away. Our trek began at 1500 meters and that day we would reach 4000 meters. Up. Jumping from small patch of grass to another small patch of grass. I felt like I was playing a human game of Frogger. Literally, 12 hours later, we were at 4000 meters. I’ve never been so high. We were surrounded by clouds with such strange flora, gigantic cows, and eventually we reached Finca Primavera. This family run farm also serves as a hostel for hikers. We stopped just to have some panella (a hot drink made of cane sugar) and continued walking towards the next Finca, Jabon. When we left Primavera, darkness quickly followed us. We were making our way by flashlight (seriously, I thought I left night hiking behind in Costa Rica). All of us were growing very weary, cold, and exhuasted. Freddy stated that it was only an hour between Primavera and Jabon but that stretched to almost two hours. We kept walking and eventually saw a light in the distance. Humberto approached on horse to guide us up the rest of the way. We had to do one last river crossing to make it to the house. I was given the hand of Esteban and Freddy. On my last step, the backpack took my balance and without their help, I would have landed, back first, in the freezing river with soaked clothes. Never have I been so grateful. Tired and weary, we made it to Humberto’s home. This house, 4000 meters in the mountains, was like stepping back 100 years in time. We sat in Humberto’s kitchen with a fire stove running to try to warm us all up. He graciously welcomed us in and made us feel at home. We drank panella con leche (fresh milk from the cow outside) and began to make our dinner. After dinner, we quickly fell asleep in the tent we pitched inside the shelter. We made our way back to Humberto’s for lunch and grabbed our bags. We then made the walk over to Primavera to stay for the night. We had a great meal with, of course, Panella. The next morning, it was time to return to society 2000 meters below. At about 8 am, we began to go down. Holy hell, did I climb all of this??? My God, I DID climb this. What we climbed a few days before in 12 hours took us 7 to decend. We were happily back in Valle de Cocora and took a Jeep back to Salento. Back in Salento, we scarfed some food and, finally, showered! Lucky us, while we were away, the hostel planned a barbeque party for the evening. We celebrated with chorizo, beers, and aguadiente and told the crazy story of our adventure. Literally, the most physically difficult thing I’ve ever done in my life. I adored Salento and my time in Colombia. The landscapes are just as beautiful as the people. No, I did not make this shirt. Can’t believe it found me! Happy #caturday! Psst. I have been writing down all the money we have spent which I will compile when I get home. We are averaging about $32 / day for everything!! I accidentally deleted my photo card in Sarajevo back in May so I kind of know how you feel. Fortunately, there were some geeks a couple of doors down from Prof Joe’s who managed to retrieve them for a price. I really wanted to experience more of Sarajevo but was too busy being pissed off. I gotta think about the back-up thing myself. Glad your having fun . Sounds like quite the adventure. Be safe .